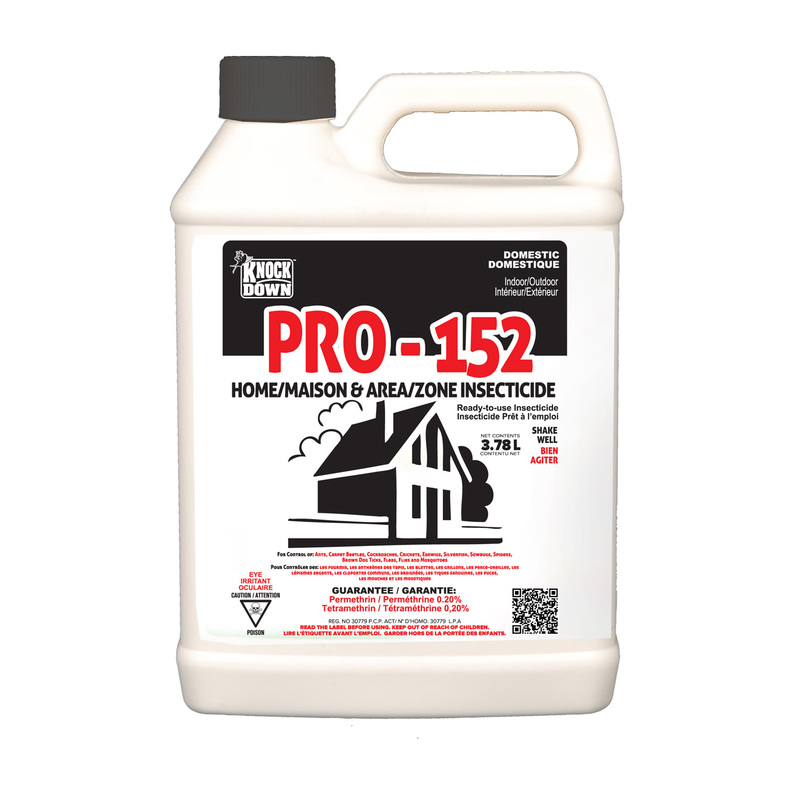 KD152DP – KNOCK DOWN™ PRO – 152™ RTU -HOME & AREA INSECTICIDE – KUUS Inc.
To Kill Ants, Carpet Beetles, Cockroaches, Crickets, Earwigs, Silverfish, Sowbugs and Spiders: Spray areas where these pests are found or may hide, including dark corners or rooms and closets; cracks and crevices in walls; along baseboards and door and window frames; behind and beneath sinks, stoves, refrigerators, and cabinets and around garbage cans, plumbing and other utility installations. Pests driven out of hiding places should be sprayed directly. For ants, apply to ant trails, also around doors and windows and wherever else these pests may find entrance. Repeat as necessary. To Kill Brown Dog Ticks and Fleas: Apply as a spot treatment to infested areas such as pet beds and resting quarters, nearby cracks and crevices, along and behind baseboards, window and door frames and localized areas of floor and floor coverings where these pests may be present. Old bedding should be removed and replaced with clean, fresh bedding after treatment. DO NOT SPRAY PETS WITH THIS PRODUCT. For effective flea and tick control, treatment of the pet must be combined with the cleanup and sanitation of any area used by the pet. Vacuum floors, carpets, furniture, etc. (discard vacuum bag after use) and wash the pet’s bedding, living quarters, and surrounding area. Flies and Mosquitoes: Use only out of doors as an aid in reducing annoyance from these insects. Spray outside surfaces of window and door frames as well as other areas where these pests may enter the home. Also spray dark corners and localized resting areas (such as under eaves) or porches, patios and garages where these insects may congregate. Flies and mosquitoes coming to rest on treated surfaces will be killed. Repeat treatment when necessary. 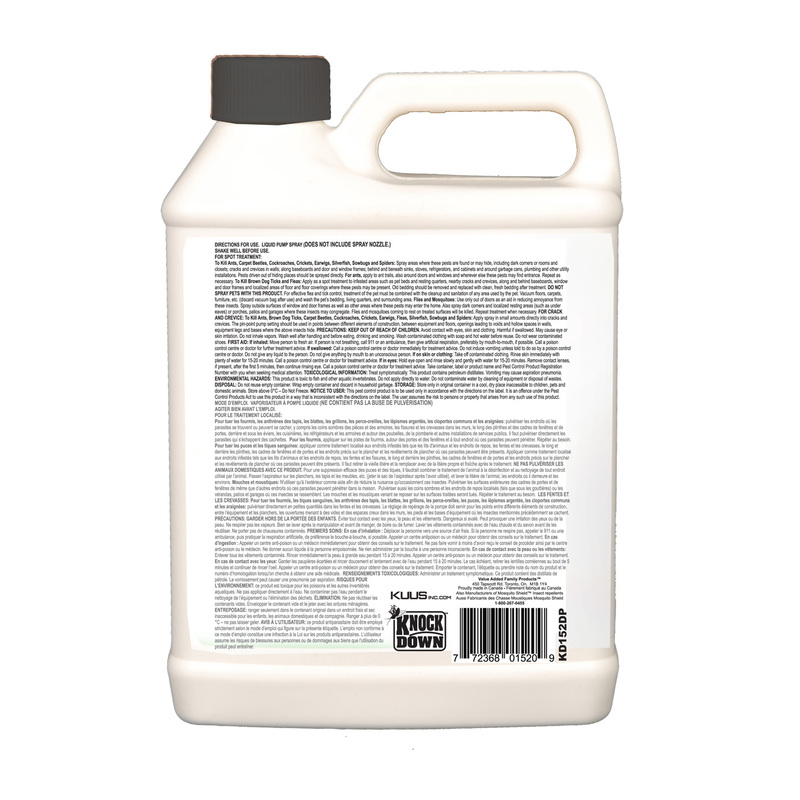 FOR CRACK AND CREVICE: To Kill Ants, Brown Dog Ticks, Carpet Beetles, Cockroaches, Crickets, Earwigs, Fleas, Silverfish, Sowbugs and Spiders: Apply spray in small amounts directly into cracks and crevices. The pin-point pump setting should be used in points between different elements of construction, between equipment and floors, openings leading to voids and hollow spaces in walls, equipment legs and bases where the above insects hide.